CHICAGO -- The owner of Chicago's only 3-Michelin-starred restaurant has invited the Clemson University football team to have a second celebratory dinner in Chicago. Nick Kokonas, co-owner of Alinea, Next, the Aviary and Roister, extended the invitation to the Tigers following their visit to the White House on Monday, in which President Donald Trump served the team fast food to celebrate their national championship win. "I could care less about college football. But I'm personally inviting the Clemson Tigers team and coaches to Chicago to experience what an actual celebration dinner should be," the restaurateur tweeted late Tuesday. "I'm not joking," the tweet, which tagged the team, continued. "Someone let them know what The Alinea Group does. It'll be worth it." Alinea Group's namesake restaurant, Alinea, has been named the best restaurant in the world at least five times. The Michelin 3-starred restaurant is known for innovative dishes and dining experiences like an edible balloon dessert. President Trump purchased the fast food because much of the Executive Residence staff, who are ordinarily responsible for catering such receptions, are either furloughed because of the longest-running government shutdown in history, or at home due to snowy weather in Washington. Hours before the team's visit on Monday, Trump told reporters, unprompted, that he would be serving "McDonald's, Wendy's and Burger King's with some pizza," he added. "I think that would be their favorite food, so we'll see what happens." The display, which included boxes of Big Macs, chicken nuggets and Filet-O-Fish, was reportedly paid for by President Trump himself. Standing behind a table brimming with fast food, Trump promoted the dinner for Clemson as "great American food." "If it's American, I like it. It's all American stuff," he added, noting the smorgasbord of pizza, "300 hamburgers, many, many french fries -- all of our favorite foods." The following day, Trump tweeted about the team's visit, claiming to have paid for more than 1,000 hamburgers that the team demolished "within one hour." Kokonas also offered to foot the bill at his celebratory dinner in Chicago. You don't invite someone and then ask them to pay... that's something a classless person would do. And it'll cost a LOT more than $3k. I mean, that's not even the vintage champagne budget for those of age. "You don't invite someone and then ask them to pay... that's something a classless person would do," Kokonas tweeted in response to someone asking for clarification on his offer. "And it'll cost a LOT more than $3,000. I mean, that's not even the vintage champagne budget for those of age." The Tigers received several other high-profile dinner invitations. On GMA Day on Tuesday, host and former NFL player Michael Strahan invited the Clemson football team to Times Square for lobster and caviar. "We're gonna give you the proper meal you deserve," he said on the show. Celebrity cook Ayesha Curry, who is married to NBA superstar Stephen Curry, also offered to host the Tigers at her San Francisco barbecue restaurant, International Smoke. @eatatsmoke will gladly feed the Clemson Tigers any day. A real feast and celebration. No 10cent dipping sauces on silver platters ????‍??????‍??????‍?? The Clemson Tigers have not publicly responded to any of these invitations. Clemson quarterback Trevor Lawrence says he has been misquoted about the team's visit to the White House. He was misquoted as saying: "President Trump got all our favorite foods. It was the best meal we ever had. Then we go and see the coastal elite media trashing it for not being organic vegan. We're football players, not bloggers. This was a perfect blue collar party." Lawrence denounced the quote Tuesday tweeting, "I never said this by the way. I don't know where it came from. However the trip to the White House was awesome!" 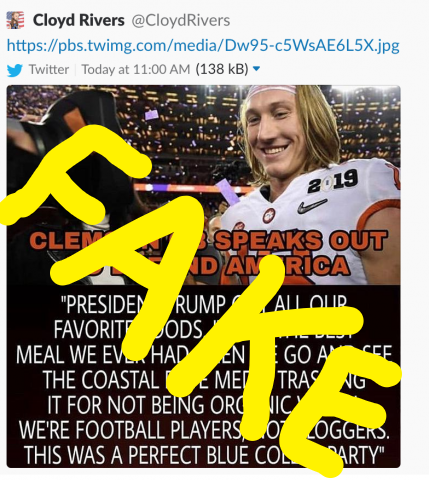 The false quote circulated in a post on social media with the claim overlaid in text over a photo of confetti falling onto the quarterback after his team's win 44-16 against the Alabama Crimson Tide on January 7.